In the Galerie Zur Matze in the Stockalper Castle in Brig, Switzerland, I will show in a solo exhibition work that I produced during my stay as an Artist in Residence in Brig on invitation of the Kunstverein Oberwallis. The Stadtgalerie (City Gallery) Werder (Havel) celebrates its 10th anniversary with an exhibition from the gallery's collection. One of my paintings that is part of the collection is shown in the exhibition. I will participate in the art fair ART FAIR ANTWERP 2018 at stand 17 of Galerie Böhner, Mannheim with a selection of recent oil paintings. The ART FAIR ANTWERP shows contemporary art presented by 80 international curated galleries. The second edition of the ART FAIR ANTWERP shows the work of estabished artists but also of internationally active emerging artists still to be discovered. The fair takes place in hall 3 of the Antwerp Expo site. Location: Antwerp Expo, Hall 3, Stand 17, Jan Van Rijswijcklaan 191, 2020 Antwerp, Belgium. 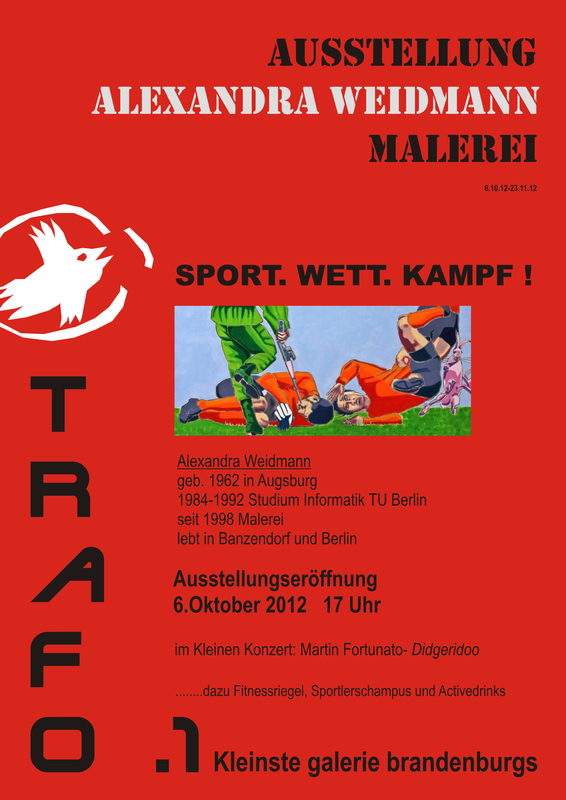 Again I got the opportunity to exhibit in Galerie TRAFO.1+2+3. 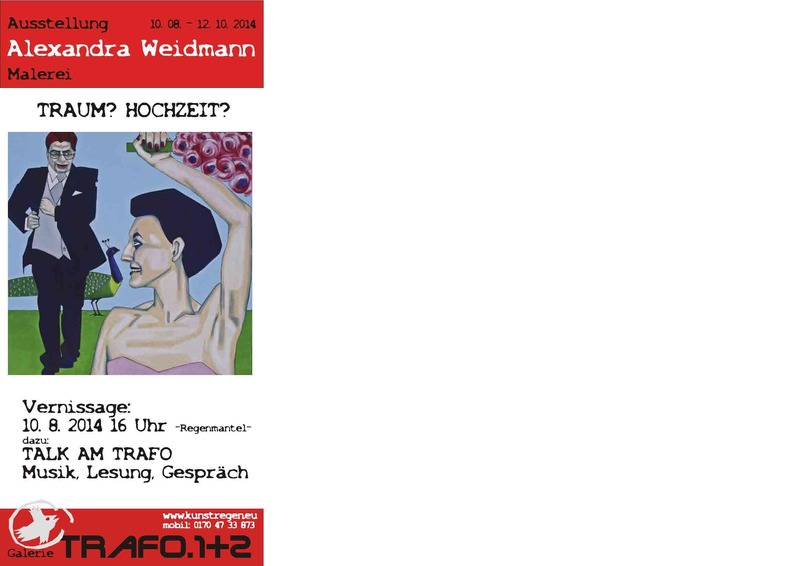 I will show paintings in a solo exhibition covering the subject "TIER.LIEBE.MENSCH" (“Animal.Love.Human”). Does it mean that animals like humans or is the subject of the exhibition the human love for animals? We don’t know what animals think about humans. Are we their food source only or do they like us also a little bit? The subject of the presented paintings is on the one hand really a loving relation between animals and humans. However, at a first glance it might be not clear who is the acting part. On the other hand, I present paintings where humans and animals are visible, but they do not have any personal relation. In Regenmantel three paintings are presented: One is “Mutter und Söhne” (“Mothers and Sons”). It shows two dachshunds (mother and son) in the foreground and a woman with a boy in the background. The second is a portrait of the writer Tanja Blixen with an owl on her shoulder. The most disturbing painting of the exhibition is surely the painting “Allen zur Warnung” (“A Warning Notice for All”). It shows two marabous pecking the body of a thrown down dead woman. This painting was provoked by a photo in a newspaper where a woman killed in police custody was put on show in a busy pedestrian zone. This breaking of several taboos induced this painting as a result of long consideration. The paintings in Dolgelin deal with dogs and humans. And in Reitwein paintings are shown that can be interpreted more allegorically. So, the man with the bunnies symbolizes joy of life as well as fertility. The painting “Labiles Gleichgewicht” (“delicate balance”) deals with the violability and fragility of life. Galerie TRAFO.3, Fischerstraße, 15328 Reitwein. The annual Kunstsalon (Art Salon) at different locations in the state of Brandenburg is taking place at the Kurt-Mühlenhaupt-Museum in Bergsdorf this year. Visual artists, authors, actors, and musicians are presenting enjoyment of art for all your senses (view invitation and program). I am participating this year with paintings expounding the outcome of war and violence. Opening Times: Saturday, Sunday and Public Holidays 1 pm – 6 pm daily. During the week on appointment (+49 33088 5055-0). Closed on Thursday. A more detailed schedule for readings, concerts, and discussions is listed in the invitation. 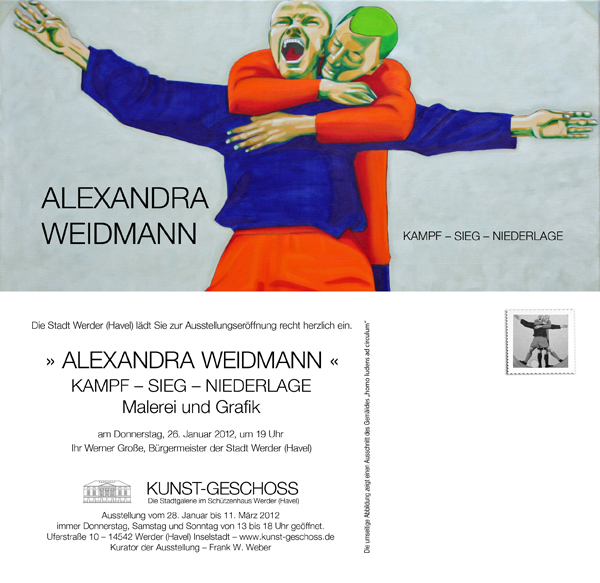 The exhibition „kleine Werke II“ (Small-size Art Works) shows works of artists who are members of the artists' association of the state Brandenburg in Germany ( BVBK). The size of the art works is limited to the format 40 x 40 cm or 50 x 30 cm and each artist exhibits exactly one art work. This allows to show the big picture of the substantial art szene in Brandenburg. Location: Produzentengalerie M, Charlottenstr. 122, 14467 Potsdam, Germany. People in movement, whether football players fighting for the ball or gymnasts in the air, the movement itself is the real subject of my artwork shown in the premises of Tanz & Art Rheinsberg e.V.. The viewer should feel the movement, the before and after of the instant pinned on the canvas. Besides an oil painting of a female soldier marching in goose-step past football players, twelve oil pastel drawings of dancers, gymnasts and football players are shown. I have been invited by Galería Gaudí, Madrid, to participate in the art fair KÖLNER LISTE 2018. In parallel with Art Cologne, the hall of XPOST Köln will be filled with contemporary art. The fifth edition of KÖLNER LISTE is designed to inspire and engage, inciting the discovery of new names and artworks. Addressing both new and experienced collectors, the fair will showcase a wide spectrum of emerging contemporary art at affordable prices. With an extraordinary selection of galleries, KÖLNER LISTE aims to become one of the most interesting art fairs in Germany. Art lovers see KÖLNER LISTE as an ideal extension to Art Cologne, a place where their knowledge of the contemporary scene is broadened and their collecting possibilities expand. I am participating in the fair at the stand of Galería Gaudí, Madrid, showing oil paintings from my series Family Life. Location: XPOST, Stand number G26, Gladbacher Wall 5, 50670 Köln. The Frauenmuseum Bonn shows the work of 33 artists dedicated to the theme of friendship taking into account its historic and social development. My contributions are oil paintings showing different manifestations of friendship. Friendship is not restricted to the positive sides of life. Friendship e.g. in rural communities often focuses on practical problems mutually helping each other. Additionally, often familiar and societal constraints result in communities of fate leading to lasting ties of friendship. This year I participate the first time in the art fair	ART BRANDENBURG in the cultural event quarter Schiffbauergasse in Potsdam in the Schinkelhalle, exhibition stand 44. The ART BRANDENBURG is an art fair in Potsdam. Artists, galerists, and art associations show their works and the Filmmuseum Potsdam shows interesting art movies. The art fair presents the contemporary spectrum of a vivid art scene embracing paintings, graphics, sculptures, photography, and performance. The participating professional artists were selected by a jury. Location: Schinkelhalle, Schiffbauergasse 4A, 14467 Potsdam. 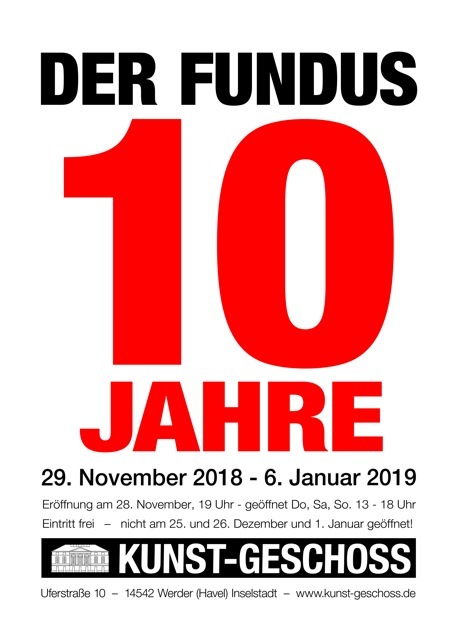 This year I participate again in the contemporary art fair	3 TAGE KUNST – Messe für Gegenwartskunst (3 days of art - contemporary art fair) organized by Kommunale Galerie Berlin. Location: Kommunale Galerie Berlin, Hohenzollerndamm 176, 10713 Berlin. The participating professional artists were selected by a jury. The exhibition „Kleine Werke“ (Small-size Art Works) shows works of artists who are members of the artists' association of the state Brandenburg in Germany ( BVBK). The size of the art works is limited to the format 40 x 40 cm or 50 x 30 cm and each artist exhibits exactly one art work. This allows to show the big picture of the substantial art szene in Brandenburg. The annual Kunstsalon (Art Salon) at different locations in the state of Brandenburg is taking place in the Gransee Cloister this year. I am participating the first time this year with paintings of my series on family life. Visual artists, authors, and musicians are presenting enjoyment of art for all your senses in the cloister and cloister garden Gransee during the first three days of the exhibition. Look forward to paintings, sculptures, ceramics, photography, literature, music, and discussions with prominent participants (view invitation and program). Opening Ceremony: Friday, August 25, 2017 at 6 p.m. Opening Times: 9 am – 5 p.m. daily. The schedule for literary readings, concerts, and discussions is listed in the invitation. 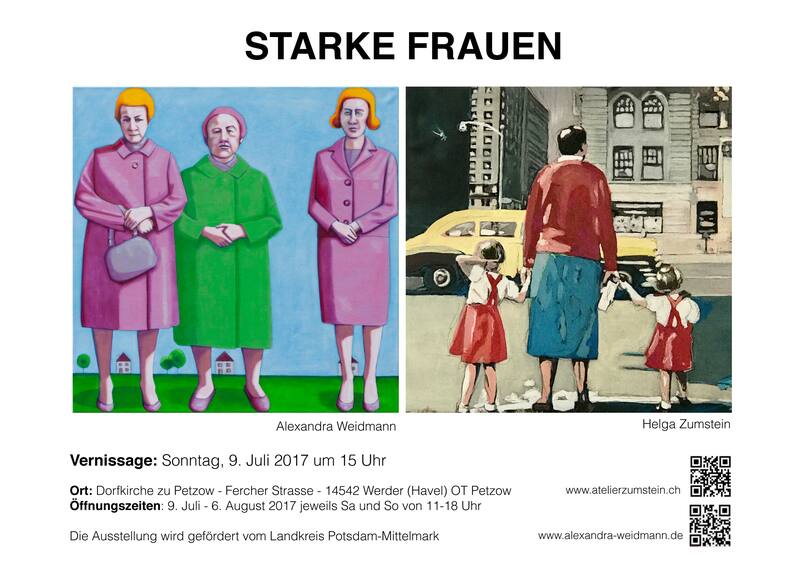 Helga Zumstein and I show paintings on the theme “Starke Frauen” (Strong Women). Strong women are women who master life. And have a lot of fun. We got to know each other exhibiting both in Agora Gallery, New York, in 2015. Even before meeting in person we started to mutually esteeming our paintings. Last year we exhibited together with additionally eight other artists in Leuk castle in Wallis, Switzerland. Now in 2017 this joint exhibition takes place in the Schinkelkirche (church built by the famous builder and architect Schinkel) in Petzow, Germany. 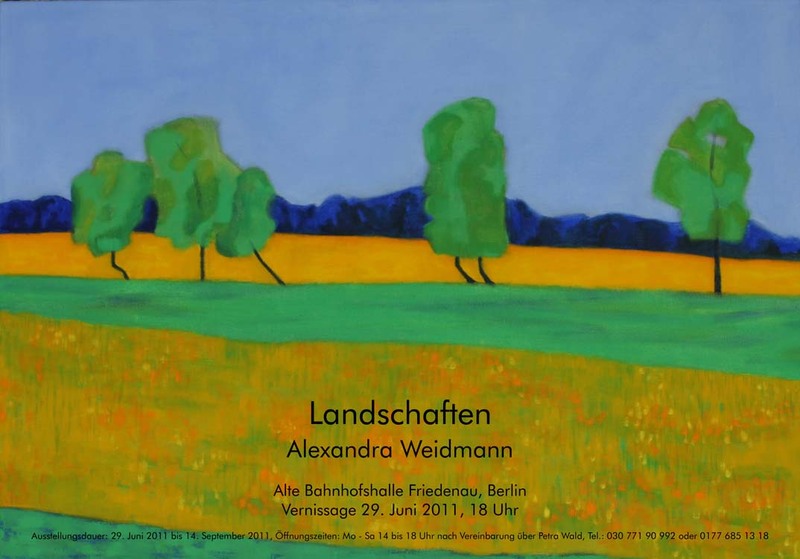 The exhibition is funded by Landkreis Potsdam-Mittelmark. Opening Ceremony: Sunday, July 9, 2017 at 3 p.m. Opening Times: Saturday and Sunday 11 a.m. – 6 p.m. 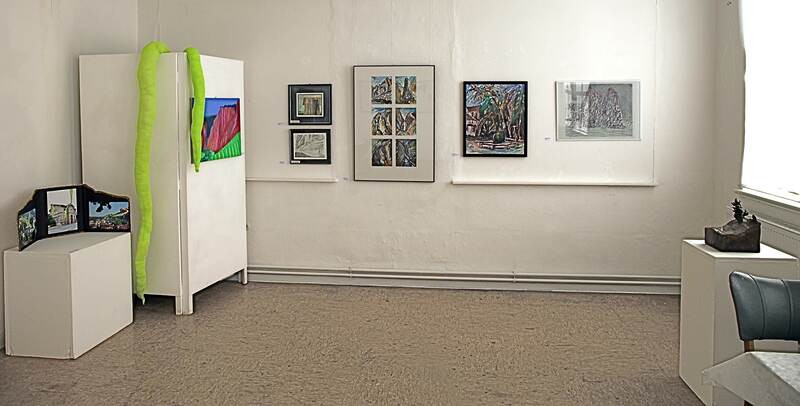 The Gallery ART-CONSULT shows the work of seven artists dedicated to the theme of summer. My contribution are oil paintings of summerly landscapes in the state of Brandenburg. The musical introduction will be provided by the Berlin singer and guitarist Mari Mana. Opening Ceremony: Friday, June 30, 2017 at 7 p.m. Opening Times: Tuesday to Friday 2 pm – 6 pm. Please register at 030 3302 4567 or info@art-consult.me in advance. The Die KÜNSTLERMESSE DRESDEN (Artists Fair Dresden) is organized by the Künstlerbund Dresden (Artists Association Dresden) and is held this year under the patronage of the British Ambassador to Germany, Sir Sebastian Wood. It is a fair of professional producers of fine arts. About 100 artists living here, having studied here, or are somehow connected to the region like invited guests from partner cities are presenting over 1.000 artist’s works from the categories painting, graphics, photography, sculpture, installation, mixed media, etc. The organizer – the Künstlerbund Dresden – naturally focusses on quality instead of quantity. Therefore, the KÜNSTLERMESSE DRESDEN is curated by an eight-member jury. This ensures that the visitors get an impression not only of the outstanding quality but also of the great variety of Dresden art and its protagonists. In 2017 Great Britain is the partner country. From Coventry, the partner city of Dresden, Martin Green and Cressida Haughton will participate supported by the state capital Dresden. The extensive framework program of the KÜNSTLERMESSE is traditionally devoted to the partner country and presents, among other things, workshops, panel discussions, and a curated film program: “Between the Lines – New British Short Films” was composed by the Filmfest Dresden (Film Festival Dresden). Additional events complement the program. In the children program, e.g. stencils are designed in the style of the artist Bansky. Or there is a panel discussion devoted to the subject „Kunstmarkt und Brexit – Neue Herausforderungen für deutsch-britische Kooperationen?“ (“Art Market and Brexit – New Challenges for the German-British Cooperation?”). During the fair the Café “England, England“ takes care of the bodily welfare of the visitors in exhibition hall 3 – not only at teatime. In addition to the mentioned guests the Künstlerbund is pleased to welcome guest from Iran and from Korea (Daejong). The Dresden Academy of Fine Arts will be represented by the class of Prof. Kerbach. Come on and join – it’s worthwhile! In some of the paintings shown in my solo exhibition in the Kunstkate Kraatz,	man and beast share the pictorial space. The observers share the exhibition space with the portrayed beasts. Where the stories told in the paintings are the sensations, the observers are objects of the curiosity of the observed. Friendly and benevolently the beasts look out of the paintings. Calmly also, the tightrope acrobat looks at us. Nobody else’s life is a bed of roses. Steed and rider tumble down to the open mouth of the crocodile. Opposite, a hamster keeps running in a soap-bubble to slip away from the grip of the diving goal keeper. How will that end up? And will the dancer on the rope keep her balance? Close-by buck rabbits are engaged in territorial fights whereas the rolls of winners and losers are already distributed. A cool soldier, sunglasses pushed up to his hair, a cigarette in his hand, strikes out for a kick. Against the darkness of the season, the luminosity of the colors comes in. Full of verve the three large paintings try to fight the darkness in the hearts not least with a twinkle in the eye. Winking back is allowed not only at the beasts. The Frauenmuseum Bonn shows in this exhibition newly restored photos of Marie Goslich (1859 – 1938) the pioneer of photo journalism. As I was intensively engaged in her photos in my art work, some of my oil paintings are shown within the framework of this exhibition. Those paintings are free interpretations of her photographic oeuvre. The group exhibition takes place in the historical bishop's castle Leuk in Switzerland and is funded by Stiftung Schloss Leuk (Foundation Castle Leuk). The exhibition shows recent work that originated during my stay in Istanbul and thereafter. 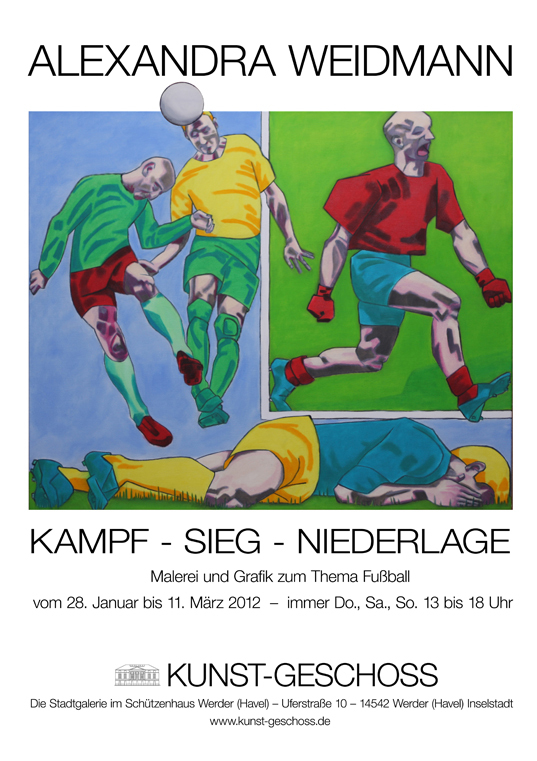 The presented paintings continue my work on the topic football in the broadest sense. For me football is a fascinating sport. Snapshots show amazing scenes, postures, gestures, and facial expressions. Fight, victory, and defeat can be witnessed. But football is also a metaphor for social processes that are transposed into representations of football scenes by dressing up the actors in football outfit. Rule violations in football and in the society easily lead offside. 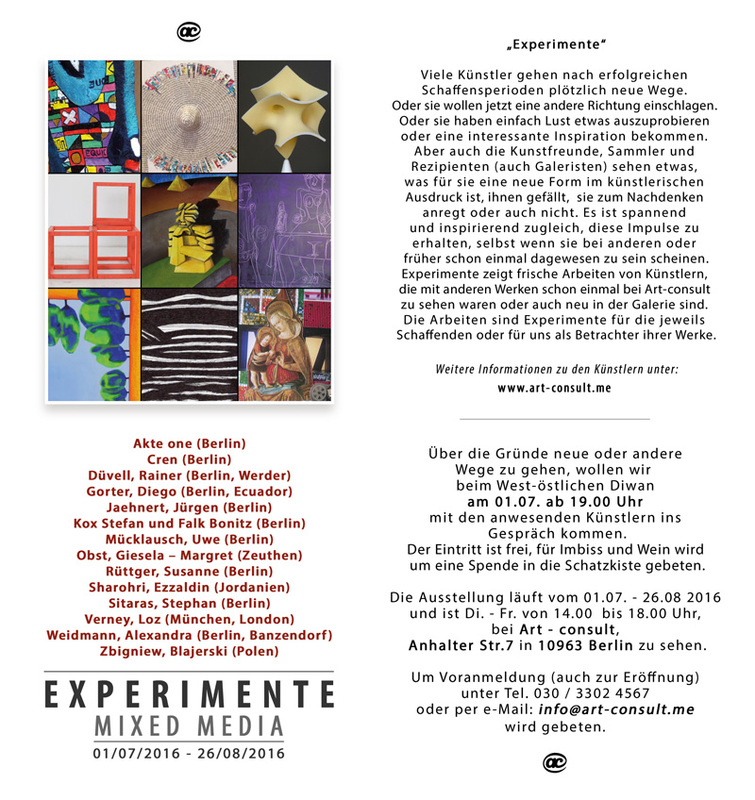 The group exhibition takes place in Boulevard Berlin and is funded by Kulturamt Steglitz-Zehlendorf of Berlin. The exhibition shows oil paintings that belong to the cycle “family life”. 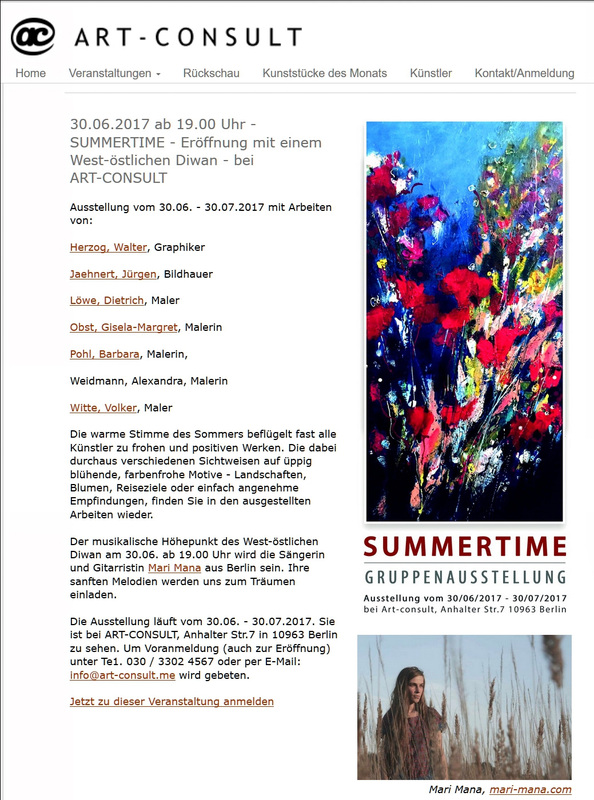 The Berlin art gallery Galerie Art-consult shows in a group exhibition artwork experimenting with new artistic approaches. My contribution is an artwork – part of a series of paintings – that deals with the eastern and the western perspective and reflects the tradition of "all-over painting". It is inspired in form by ottoman book illustrations but is applied to panel paintings using the example of a landscape in Brandenburg. On the occasion of the inauguration of the new gallery Trafo. 3 in Reitwein I will show more recent paintings in a solo exhibition entitled "Drei Galerien · Zwei Welten · Eine Idee" (“Three galleries · Two worlds · One idea”). 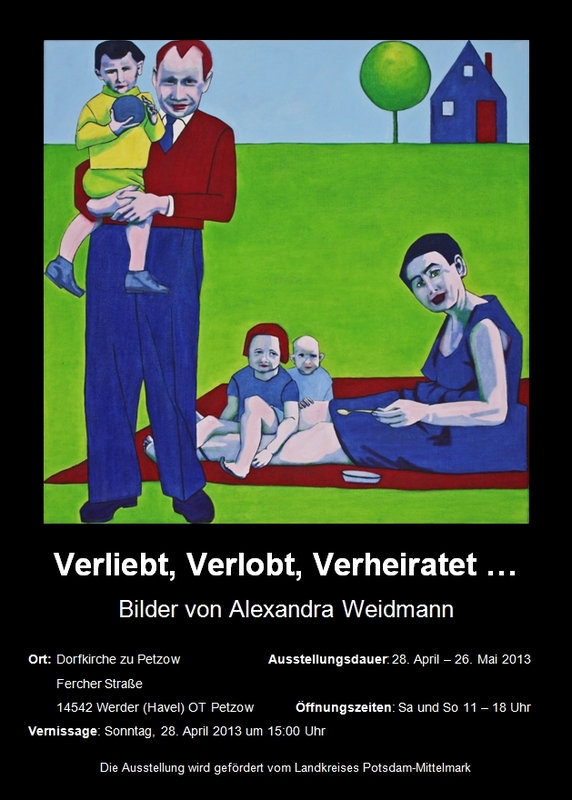 The Galerie K in Bad Kreuznach shows in a solo exhibition oil paintings that belong to the cycle “family life”. During the years I kept studying the legacy of the German photo journalist Marie Goslich (1859-1938). 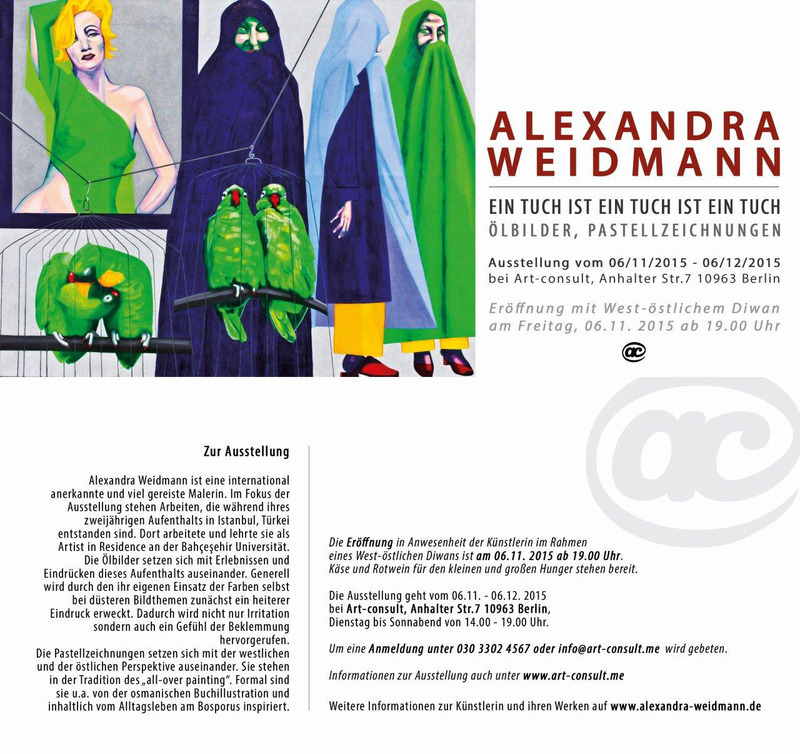 As part of the Women's Week 2016 in Brandenburg a part of this artistic dialogue is exhibited. The selection meets the motto of the Women's week “Women Generations in Interaction”. Besides my work, corresponding photographs of Marie Goslich are exhibited. During the vernissage there will be held a panel discussion on the subject “How did different generations of artists approach the problem of describing reality”. The Berlin art gallery Galerie Art-consult shows in a solo exhibition oil paintings and pastel drawings that originated during my stay in Istanbul. The title of the exhibition can be translated to "A cloth is a cloth is a cloth". The oil paintings deal with impressions and experience gained during this stay. Generally speaking, the specific employment of colors initially evokes a cheerful impression of even dark-mooded motives. This not only creates irritation but also a sense of trepidation. The pastel drawings deal with eastern and western perspective. They reflect the tradition of "all-over painting". And they are inspired in form by ottoman book illustrations and content by everyday life at the Bosporus. Opening times: Tuesday – Saturday 2 pm – 7 pm. Please register at 030 3302 4567 or info@art-consult.me in advance. This year I participate in the contemporary art fair	3 TAGE KUNST – Messe für Gegenwartskunst (3 days of art - contemporary art fair) organized by Kommunale Galerie Berlin. Location: Kommunale Galerie Berlin, Hohenzollerndamm 176, 10713 Berlin. 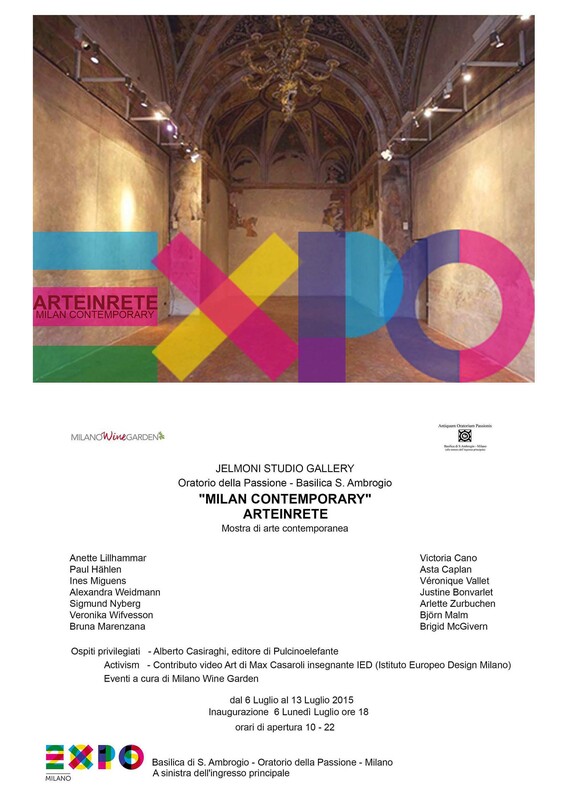 The JEMONI STUDIO GALLERY, Milano, Londra, Berlino exhibits my paintings in a historical environment in Milan, in the Oratorio della Passione of the Basilica di S. Ambrogio. They are part of the cycle “family life” that narrates episodes of human life. Despite of seemingly invariant repetitive elements in family life there is a clear reference to the actual societal relations visible. Location: Oratorio della Passione, Basilica di S. Ambrogio, Piazza Sant’Ambrogio 15, 20123 Milan. Since 2014 I am represented by Agora Gallery in New York. My first exhibition in New York, or more precisely, in the heart of the famous Chelsea art district, will show a gallery made selection of my paintings. In der Einzelausstellung zeige ich Bilder aus der Serie „Verliebt, Verlobt, Verheiratet...“. 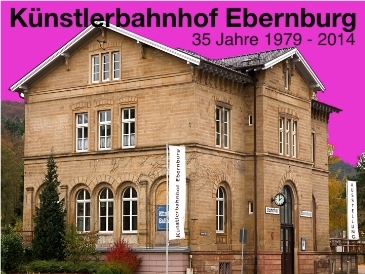 Im Künstlerbahnhof Ebernburg und im im Schloßparkmuseum Bad Kreuznach werden zum 35-jährigen Bestehen Exponate aus dem Archiv des Fördervereins gezeigt. Der Förderverein vergibt Arbeitsstipendien an Künstler und kauft Werke der geförderten Künster an. In der Ausstellung ist ein während meines Aufenthalts im Künstlerbahnhof Ebernburg im Sommer 2007 entstandenes Bild vom Rotenfels zu sehen. Gezeigt werden Bilder wie man sie aus Familienfotoalben kennt. In dem Bilderzyklus „Verliebt, Verlobt, Verheiratet…“ geht es um die immer wiederkehrenden Lebenssituationen wie Kindheit in der Familie, Partnerwahl und Gründung einer eigenen Familie. Eine Generation folgt der vorherigen. Die Bilder der Ausstellung beschäftigen sich zum einen mit dem Heiraten an sich, d.h. Eintreffen von Braut und Bräutigam, das Tauschen der Ringe, das Werfen des Brautstraußes und das Anstoßen auf die gemeinsame Zukunft. Dann wird das erste Kind geboren. Dann kommen weitere Kinder dazu und die Eltern versinken in der Elternarbeit. Das Paar wird älter, die Kinder suchen sich Partner und wieder ist ein Zyklus durchlaufen. Die Bilder, die auf Collagen von Fotos aus Familienalben beruhen, spiegeln auch zeitgeschichtliche Veränderungen wieder. Werden in der Elterngeneration noch viele Kinder geboren, so sind es in unserer Zeit keines, ein oder zwei Kinder. Oder man kommt ganz auf den Hund. Andere Paarungen als Mann und Frau sind denkbar. Auch wenn die Bilder durch Familienalben inspiriert wurden, wollen sie keine wirklichkeitsgetreuen Portraits darstellen. Zeitbezüge werden verstärkt etwa durch die Einblendung von Erinnerungsfetzen, wie etwa die an Pril-Blumen erinnernden Muster auf den Kleidern im Bild „Ganz der Papa“. Andererseits setzten sie sich aber auch leicht ironisierend mit herrschenden Klischees auseinander, die uns entweder immer noch verfolgen oder gar lieb und teuer geworden sind. Die Ausstellung wird gefördert vom Landkreis Potsdam-Mittelmark. Kultur hat Platz im kleinsten Haus! In einem zur Galerie umgebauten Transformatorenhaus zeige ich drei Bilder aus der Serie „Fußball – Kampf – Sieg – Niederlage“. Exhibition 2012: „Kronprinz Friedrich im Ruppiner Land“ – eine Kunstausstellung zum 300. Geburtstag von Friedrich II. Aus Anlass des 300. Geburtstags von Friedrich II. präsentieren Brandenburger Künstler der Region Ostprignitz-Ruppin ihre Reflexionen zum Kronprinzen und späteren König Friedrich II. 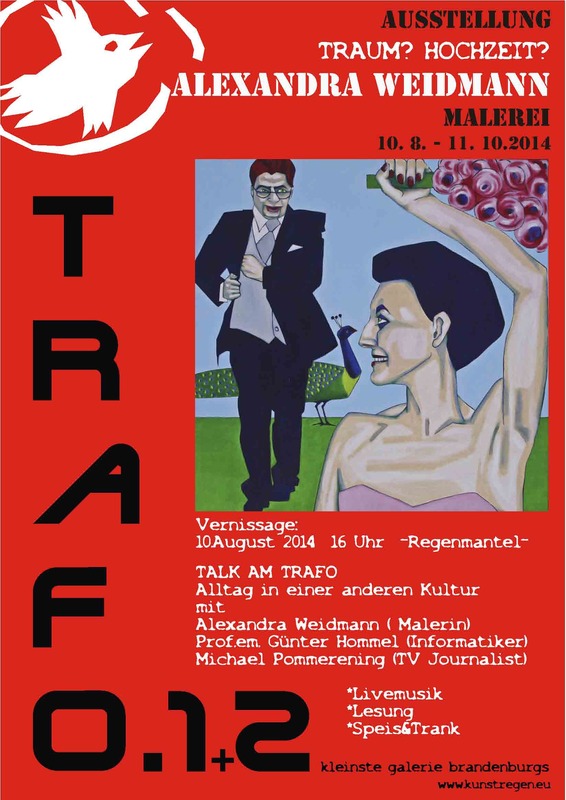 Ich beteilige mich an der Ausstellung mit einem Dyptichon mit dem Titel "Fridericus Rex – vita brevis, ars longa". Die Ausstellung wird vom Landkreis Ostprignitz-Ruppin im Rahmen der Veranstaltungsreihe „Sans Souci im Ruppiner Land“ unterstützt. Exhibition 2012: „Abmachen? Neumachen! 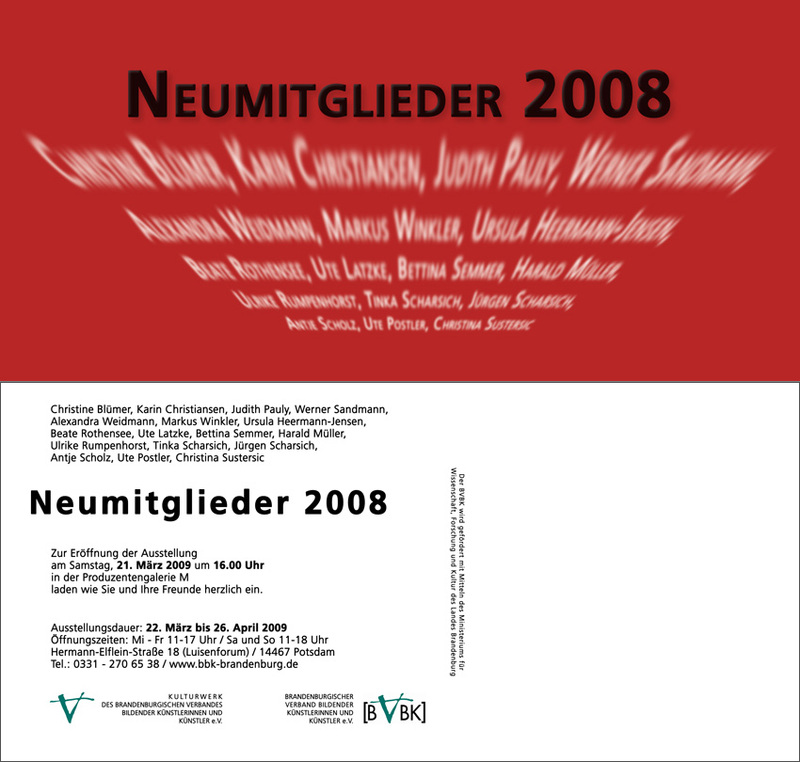 – Marie Goslich revisited"
Nach einer ersten Einzelausstellung von Bildern und Zeichnungen nach Motiven der Fotografin Marie Goslich im Jahr 2010 und einer zweiten Einzelausstellung 2012 im Kultusministerium Potsdam widmet sich diese Ausstellung erneut dem Werk Marie Goslichs. Ermöglicht wurde diese Ausstellung in Frankfurt(Oder), der Geburtsstadt Marie Goslichs, durch ein Stipendium des Frankfurter Kunstvereins, das einen vierwöchigen Arbeitsaufenthalt in Frankfurt(Oder) und diese Ausstellung in der Galerie B umfasst. Wieder hat Dr. Krystyna Kauffmann, die sich der Erforschung und dem Erhalt des Werks von Marie Goslich verschrieben hat, einen wesentlichen Anteil am Zustandekommen dieser Ausstellung. Sie stellt vor allem die hier gezeigten Fotos von Marie Goslich zur Verfügung. Zum Titel der Ausstellung: „Abmachen und Neumachen" wird in der großen Dürer-Ausstellung in Nürnberg derzeit intensiv thematisiert. Zu Dürers Zeit sagte man noch „abmachen", wozu wir heute „nachmachen" sagen. In der Dürer-Ausstellung wird klar gezeigt, dass auch große Genies auf den Schultern von Vorgängern stehen und durch andere Arbeiten zu eigenen kreativen, weiterführenden und teils sogar zu maßstabssetzenden Werken angeregt werden. Exhibition 2012: „Zwiegespräch – farbiger Dialog mit schwarz-weißer Fotografie"
Nach einer ersten Einzelausstellung von Bildern und Zeichnungen nach Motiven der Fotografin Marie Goslich im Jahr 2010 zeigt diese Ausstellung eine Fortsetzung und Weiterentwicklung dieser Arbeiten. Stand die Hinzunahme von Farbe zu den Motiven der schwarz-weißen Fotografien von Marie Goslich im Vordergrund, kommt jetzt ein freierer Umgang mit Ausschnitten durch Herauslösen von Bildelementen aus dem alten Kontext und durch räumliches und zeitliches Verschieben in die Gegenwart hinzu. Dadurch entstehen neue, subjektive Sichten. Mein Zwiegespräch mit Marie Goslich über ein Jahrhundert hinweg hat durch diese Arbeiten eine neue Intensität erreicht und wird auch in der nächste Zukunft nicht abreißen. Wieder hat Dr. Krystyna Kauffmann, die sich der Erforschung und dem Erhalt des Werks von Marie Goslich verschrieben hat, einen wesentlichen Anteil am Zustandekommen dieser Ausstellung. Die Ausstellung wird vom Brandenburgischen Ministerium für Wissenschaft, Forschung und Kultur gefördert. In der Einzelausstellung zeige ich Bilder, die das Thema „Kampf, Sieg und Niederlage“ aufgreifen. Dabei werden verschiedene Fußballszenen miteinander zu Bildgeschichten verknüpft. Durch die Hinzunahme weiterer Protagonisten wird das Thema über den Fußball hinaus ins Allgemeinere, d.h. auf andere Bereiche der Gesellschaft übertragen. In der Gemeinschaftsausstellung zeige ich Grafiken von Küchenschaben in Ölpastell, die uns als ständige Konkurrenten bei Tisch begleiten. Die Grafiken zeigen mehrere Millionen Jahre alte Versteinerungen dieser Spezies. Nur die Versteinerten sind still! In der Gruppenausstellung zeige ich Arbeiten, die während der Internationalen Sommerakademie in Salzburg zum Thema Landschaftsmalerei unter der Leitung von Matts Leiderstam entstanden sind. In der Einzelausstellung werden Bilder von Landschaften, überwiegend aus Brandenburg, gezeigt. Der Schwerpunkt liegt auf der Ölmalerei. Daneben sind auch einige Grafiken zu sehen. 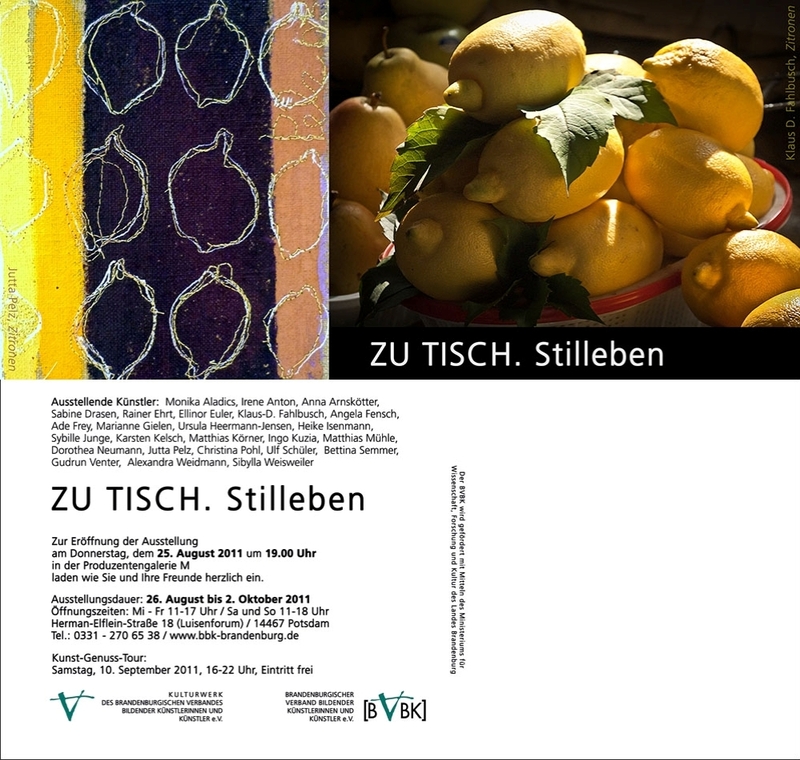 Diese Ausstellung wird organisiert von der Stadtgalerie Kunst-Geschoss im Schützenhaus in Werder. Ich wurde vom Kurator der Stadtgalerie, Frank Weber, zur Teilnahme eingeladen und werde neuere grafische Arbeiten in Kohle, Acryl und Ölpastel anbieten. Die Stadt Werder lädt an diesem ersten Adventswochenende zum Adventsspaziergang in der Stadt ein. Der Zuweg zum Schützenhaus wird beleuchtet und weihnachtlich geschmückt sein. Diese Ausstellung findet statt mit Förderung von Kulturland Brandenburg e.V. und vom Landkreis Potsdam-Mittelmark in der Dorfkirche zu Petzow (Werder) zusammen mit Gisela Gräning, Heike Isenmann, Heide Lüders, Annette Strathoff und Petra Walter-Moll im Rahmen von Kulturland Brandenburg, Mut und Anmut. Heutige Brandenburgische Künstlerinnen treten in Kontakt zu Künstlerinnen, die „vor unserer Zeit“ hier lebten. Jede setzt sich mit ihrer Arbeit zu einer Persönlichkeit in Beziehung, die ihr besonders am Herzen liegt und deren Leben und Werk sie berührt oder beeinflusst hat. Ich zeige in der Ausstellung neue Bilder, die durch die Fotografin Marie Goslich inspiriert wurden. Zeitgenössische Künstlerinnen in Bezug zu ihren historischen "Schwestern"
Diese Ausstellung findet statt mit Förderung des Kulturvereins Bahnitz in der Kunsthalle Bahnitz. Kurator: Bodo Rau. Einen kleinen Eindruck von der Ausstellung vermittelt auch die Einladungskarte. 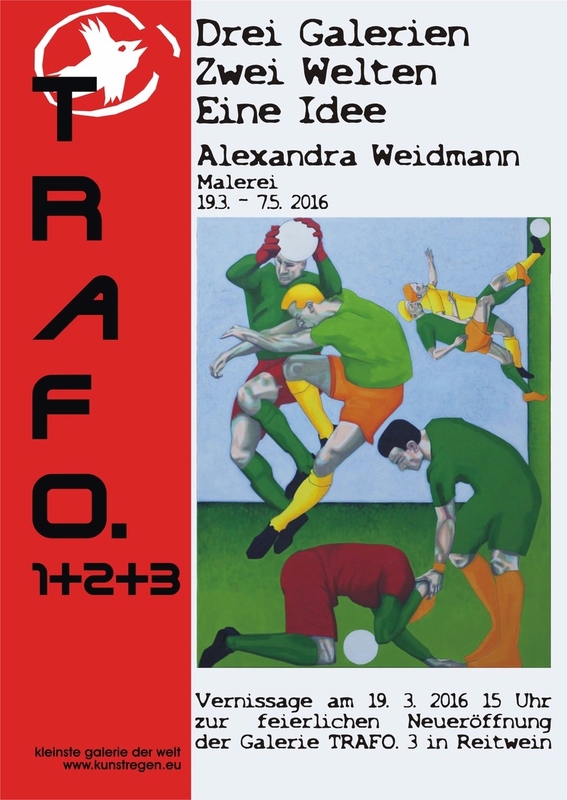 Ich zeige in der Ausstellung Ölbilder und Zeichnungen zum Thema "Fußball". Ort: Dorfstraße 1, 14715 Milower Land OT Bahnitz. Hier Informationen zur Anreise und zum Künstlerdorf Bahnitz. In der Ausstellung zeige ich Bilder von Deutschen Landschaften auf Einladung der Indo German Friendship Society anlässlich der 2nd German Cultural Week in Goa. Die Ausstellung in der Galerie M, Potsdam, zeigt Arbeiten der im Vorjahr neu aufgenommenen Mitglieder im Brandenburger Verband Bildender Künstlerinnen und Künstler e.V. (BVBK). Ort: Hermann-Elflein-Str. 18,(Luisenforum), 14467 Potsdam. Im Rahmen der Kunsttour Caputh zeige ich neuere Ölgemälde und einige Tonplastiken. Ort: Kunstremise am Schloss, Krughof 38, 14548 Schwielowsee. In der Einzelausstellung werden vor allem Bilder gezeigt, die während eines durch ein Stipendium finanzierten Arbeitsaufenthalts im Künstlerbahnhof Ebernburg bei Bad Münster entstanden sind. Der thematische Schwerpunkt liegt auf der Landschaftsmalerei. Ausstellung bei der 4. Accrochage in der Galerie Noah, Augsburg, zusammen mit Richild Holt, Oskar Manigk, Rüdiger Moegelin, Luigi Troia, Christine Vontz, Thomas Weczerek und Felix Weinold. Zeitgleich findet in der Galerie eine große Einzelausstellung von Elvira Bach (Malerei, Skulptur 1986 - 2007) statt. Einzelausstellung in der Galerie Kunst im U, München, in der ein Querschnitt durch die in den letzten Jahren entstandenen Kunstwerke gezeigt wird.